AFLP fingerprinting, nrDNA sequencing, and HPLC of phenolic compounds from bark samples was used to assess the intensity of hybridisation in two mixed stands of Salix alba, S. fragilis, and their hybrid S. × rubens (Salicaceae) along the Danube in the vicinity of Regensburg (SE Germany). AFLP analyses of 130 individuals from two mixed and two pure strands of the parental species resulted in a matrix of 337 polymorphic loci that was analysed with Bayesian cluster algorithms implemented in the software programmes Structure and NewHybrids. The results, together with sequence polymorphisms of the nrDNA ITS1 + 5.8S region, indicate that the three taxa are distinctly separated and that only a few F2-hybrids and no backcrosses to the parental species are present in the surveyed mixed stands. These findings were corroborated by HPLC studies of the phenolic compounds from bark samples that were carried out for the same individuals. A multivariate statistical analysis of relative peak areas of chromatograms (PCA, principal component analysis) indicates the clear separation of parental and the intermediate position of S. × rubens individuals. 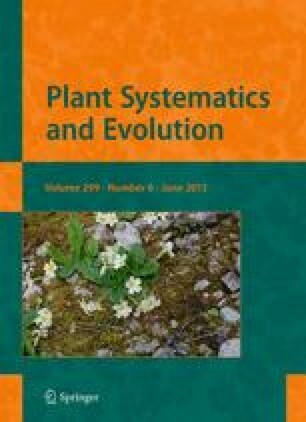 The technical assistance of Peter Hummel and the support by Dr. Roland Greiner and Manuela Bog in the molecular laboratory of the Plant Evolution and Systematics group (Institute of Botany) at the University of Regensburg is gratefully acknowledged. Special thanks go to Dr. Guido Jürgenliemk, Dr. Magdalena Motyl and Dr. Anne Freischmidt (Institute of Pharmaceutical Biology) for fruitful discussions and introduction to HPLC analysis. Jürgen Klotz (Regensburg) provided valuable information concerning the occurrence of mixed and pure stands of S. alba, S. fragilis, and S. × rubens in the surroundings of Regensburg. Two anonymous reviewers are acknowledged for their most valuable comments on a former version of the manuscript that improved this contribution considerably.